I have a new director of the organization I work for. 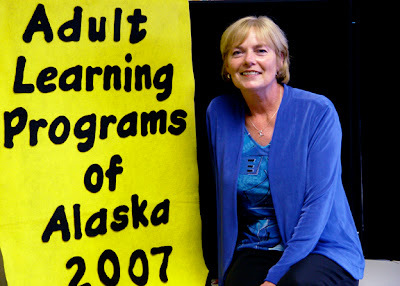 If you care to know, I work for ALPA, or the Adult Learning Programs of Alaska. The new director is Lynette Bergh. Is Lynette, by any chance, from Niles, Illinois? I don’t know is Lynetter is from Niles, Illinois? I’ll have to ask, and as far as her being the director of AlPA, I’m afraid she isn’t anymore. I believe the Board has made a terrible mistake. In fact a mistake that will cost them dearly in good will and my further employment with them as an instructor. As of Monday, I will submit my resignation. I’m sorry to hear about that Robert. Please think carefully about “falling on your sword” over this. The contributions you can make as an instructor are far too important to be cut short by what you perceive as poor judgement on the Board’s part. Hi, anonymous 1. Yes, I am from Niles, Illinois. Are you from Niles, too? No, I’m not from Niles. hey, bob, your director must have had a big influence on you to have you feel so strongly about resigning. An author, Eugene B. Habecker, once said, “The true leader serves. Serves people. Serves their best interests, and in so doing will not always be popular, may not always impress. But because true leaders are motivated by loving concern rather than a desire for personal glory, they are willing to pay the price.” That about sizes it up, don’t you think? Yes it does, and she was like that. She had faith in me that I could teach computer. I’ve never taught and I did, my students were happy with what they learned and I like teaching. They did the agency a great disservice by firing her. Why was she fired? Did she tell you? The board wouldn’t tell us why she was fired. I suppose one should talk to her personally as to what they told her she was fired for. It’s none of my business and the board made that perfectly clear. I understand the need for secracy concerning personal business. I mean wholly crap someone may sue them or hold them accountable. But remember the vote was unanimous they could tell us that. Sounds like K-Mart in Cheyenne, Wyoming all over again.